You can’t develop a stent or pacemaker without imposing strict size limits on the envelope. What permitted the miniaturization of electronic devices were size limits imposed by product development teams. It is obvious in engineering and it is obvious to me with respect to sales and marketing. Hey, it seems obvious, but if you don’t have a glass to contain water it is going to flow everywhere. That is exactly what happens with most press release writers. 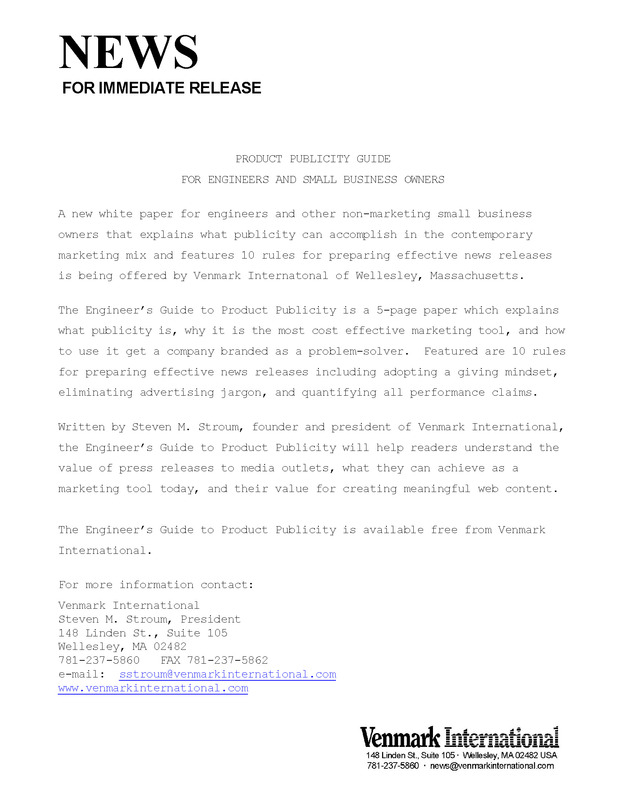 There’s a difference between writing press releases and crafting product publicity releases. The three main reasons most product press releases get thrown away by editors are because they are too long, are too advertising- like, and include quotations from egocentric bosses. And if they are paid for to be published online, it doesn’t change anything. They are still not credible and hard to read. My approach to product publicity involves strict limits and controls on the entire process of content creation and distribution. This has allowed Venmark International to become the leading product publicity firm in North America. We absolutely must be creative because we only allow ourselves four very concise paragraphs to convey our message to editors. And we do this in a one-page format. And while doing so, we explain what a product is, what it does, how it does it, where you get it, and what it costs. Of course we could write several pages about each product, but then our product news releases would be thrown away like most are! The Venmark format requires limits. Creativity requires limits.